We hope you'll agree that Benedict, our eccentric Events Co-ordinator, has grown some seriously enviable facial hair! 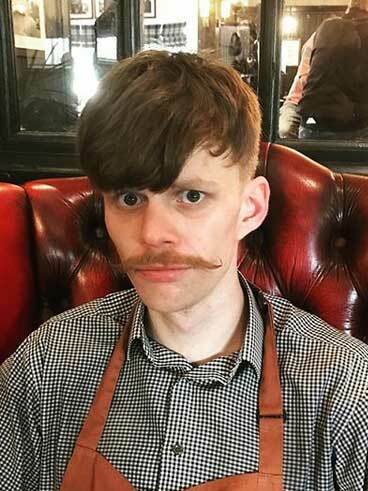 He'll (probably) be shaving it off on Friday December 1st so If you would like show your support for him, donations can be made either at the pub or at their Just Giving page. We think this look is very 'Terry Thomas' and could really catch on. Anyone born after 1980 will probably need to Google Terry Thomas to see the resemblance! Christmas is the time of giving and, with the support of Robinsons Brewery, we will be donating 5p of every pint of our Christmas beer to the Penlington Foundation. Even better still, the beer is a Penlington Foundation beer named ... Chin, Chin! Here we have Benedict posing with a jar of humbugs. Just look at that moustache now! Behind the bar we will be running a competition to guess the number of humbugs in the jar. The winner will receive a £100 Voucher to spend at the George & Dragon in the New Year as well as the whole jar of humbugs! Ask one of our colleagues if you would like to have a go!